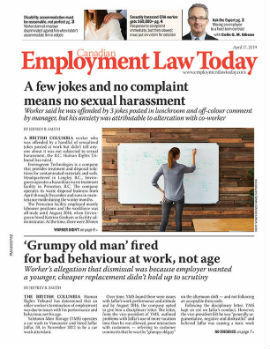 The Federal Court of Appeal has reinstated an adjudicator’s finding that a terminated employee was entitled to $250,000 in damages for injured reputation. In October 2005, Douglas Tipple was hired by the Department of Public Works and Government Services Canada (PWGSC) as a special advisor to the deputy minister, tasked with performing a number of duties related to PWGSC’s Real Property Transformation Agenda. The position offered to Tipple was for a period of three years, but he was verbally advised the position could last as long as five years. Tipple accepted and relocated his family from Toronto to Ottawa. Tipple appeared to be doing a good job, evidenced by a positive performance review he received from the deputy minister on June 26, 2007. Near the end of June 2007, Tipple and another advisor travelled to the United Kingdom to meet with officials who were engaged in a similar project there.